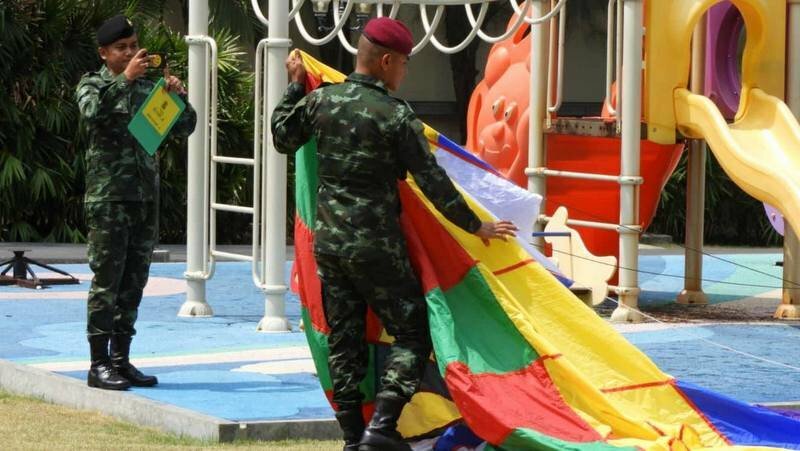 PHUKET:-- Three parasailing operators at Kata Beach were found today to have unsafe parasailing equipment, the Phuket Marine Office has confirmed. Good of the Paratroopers to discover this before some unsuspecting tourist gets killed. Before another tourist gets killed. Parasail is one thing, but who would bungee jump in Thailand? You just couldn’t trust them. "Any parasail operators who are found to repeatedly have unsafe equipment stood to have their operator’s license revoked." How on earth can an operator with unsafe equipment be allowed to retain an operator's licence? They can throw people up in the air "repeatedly" with unsafe equipment. Even in the army they don't trust these guys. That explains why every "official" precautionally buys the popular jumper badge at the tailor shop, instead of jumping from a 12m high tower on a rubber rope. I love how they were given advanced warning of the inspection. I wonder how many took the day off? I served twenty years in a military uniform and laugh at the trinkets, bobbles and wings that adorn so many costumes hereabouts.